This is a new favorite in our house. I thought that the salsa might be too spicy, but the kids didn't complain once. My kids each ate their weight in this soup. It smelled delicious while cooking, and tasted even better. This is a brain-child of Natalie, who emailed me early last week. The neat part about this soup is that she (and then I did, too!) used dry black beans instead of canned or pre-cooked dried beans. The beans will take a super long time to soften, so this is a great candidate for those who are out of the house for long periods of time. It's soup---there's a lot of volume, and it won't burn on you. The even-neater (more neat?) trait of this soup is that there is no chopping or dicing, yay! Thank you so much, Natalie! I used a 6.5 quart crockpot. You will need a 4 quart or larger. black beans in enough water to cover and another 2 inches overnight. In the morning, drain the water and rinse the beans. If you don't have super hard water or live in a super high altitude, you can quick soak the beans by pouring boiling water over them and let them sit for an hour or two. I did an hour, but 2 would really be better if you have the time. Drain and rinse the beans. Add to the crockpot. Put in the chicken, and add the broth and salsa. Pour in the corn and mushrooms, and add the cumin. Stir, but don't disturb the beans---let them stay at the bottom of the pot, closest to the heating element. Cover and cook on high for 9 hours. Yup. High. For 9 hours. It took a crazy long time for the beans to soften, but they did. If you are using beans you soaked overnight, canned beans, or pre-cooked beans, you can cook on low for 6-8 hours, or on high for 4-5--similar to normal soup-cooking time. If you'd like to thicken the broth (I did this), you can use your immersible blender (I love that thing) to blend a bit of the beans and chicken. If you don't have one, scoop out 2 cups of the soup and carefully blend in your traditonal blender. Stir the mixture back into the crockpot. Stir in the 1/2 cup of sour cream before serving, and garnish with shredded cheese and avocado slices. We all loved this. My crockpot was more than half way full, but the four of us ate so much we only had a small tupperware full for leftovers. This is a new favorite in our house. I thought that the salsa might be too spicy, but the kids didn't complain once. They are used to spicier things than some of their peers, but I didn't find the soup spicy at all, just packed with flavor. If you're concerned, stick with mild salsa. You can always add some white or red pepper to the grown-up portions. Thanks again, Natalie, for a new family-favorite! I have LITERALLY made thousands of crockpot recipes and these are the best ones!! This sounds amazing. I am looking forward to trying this. Sounds very tasty! This could be SB diet friendly too if you leave out the corn. I love your blog. I have one question about this recipe. Do you cook the chicken before you put it in the crock pot? It really was quite tasty, Erin! ooh, that's good to know, Kalyn. Day by Day, my chicken was raw, and frozen too. Thanks for getting right back to me on that. I can't wait to make this. This sounds incredible! I will definitely be making this one!!! Thanks! I just recently found your site. When I read this recipe today I ran right to the fridge to see how much salsa was left in the big jug we buy from Costco. I knew I had everything else on hand. Wouldn't you know it, I had EXACTLY 16 oz of salsa. As of 2 minutes ago, it's all in the crockpot and I can't wait to try it. Right up my alley! Thanks for posting it. Anyone got any ideas on what else I could put in there besides mushrooms? Looks delicious! I'm going to try this yet this week, before Thanksgiving, when my fridge (and my family!) will be stuffed. :)Thanks! YAY, Trish! That's so cool; I love it when that works out. anon, feel free to leave out the mushrooms. If you'd like some more texture, you can add a sliced red bell pepper. Oh, YUUUUUUUUUUUUUUUUUUUUUUUUM. Can't wait to try it, maybe tomorrow. I just found your blog, and I can't believe that I am 328 days late! I am giddy over finding you. Do you know that I just asked my husband for a crockpot recipe book for Christmas? Now I can start early! I'll be back, and I'm adding you to my favorites! What kind of salsa did you use? I made a chicken tortilla (actually turkey using leftover crockpot turkey that I experimented with!) soup last week and the salsa was the most dominant flavor. I used a fresh salsa, and it was good, but not exactly the flavor I was looking for in a soup. We are going to make this since we have dried beans from our CSA. Question. Can you use more than one cup of beans? Would you have to adjust the liquids? Thank you! What do the mushrooms add to the soup? I personally love mushrooms, but they sound like such a strange ingredient to add to this soup. Shyla, I used Pace. I have a tortilla soup recipe that you might like. Becca, the beans will continue to grow in the crockpot. If you're going to increase the beans, increase the broth. So for 2 cups of dried beans, use 8 cups of broth--unless you want it more bean-stewish instead of soupish. In that case, use 6 cups of broth. SLM, the mushrooms are in there because we had a half-package leftover from making homemade pizza. ;-) You can most certainly omit them. *I only had 1 can black beans, so I added a can of refried beans. I'm hoping that will add thickness and subtle flavor as well. *Also, a hint of lime juice sounded good! I have Penzey's Spices "adobo seasoning" which contains cumin and added that. Can't wait for dinner tonight! Hi, it's Natalie, the originator of this concoction. (I'm so excited and proud it made on this hallowed blog!) To anon, and others, I used onion, carrot, celery, pepper, mushroom, and a little fresh cilantro. Also some dry herbs and two slices of uncured bacon (trimmed of some fat, diced, and added raw.) I think the sour cream's perfect, but you could also use cream cheese or plain yogurt. Oh, and very important- squeeze on some lime at the end! This looks great Steph! I'll definitely be trying this, but after Thanksgiving. I've been a crockpotting fool the past two weeks and have been freezing stuff to live off of in December :) In fact, I have your buffalo chicken wing soup (made with turkey this time, though) cooking right now. Thanks for another great idea. That's a good looking avocado in your picture. Where are you finding decent avocados this time of year? I can't wait to try this! I just told my husband about an hour ago, as I stirred the black bean soup on the stove, "I'm going to make some beans in the crockpot soon. I don't know what kind, and I don't have a recipe, but I'm gonna do it." Waaaa-la! Thank you! And what perfect timing - my 15 year old, bean-hating (but ever so sweet)step-son is visiting his grandparents for the week so I don't have to traumatize him with it either - double score! Good soup! I did mine with thawed chicken and unsoaked beans and it was done in 6 hours on low- I think the frozen chik is what made yours take so long. but results all the same! YUM! Sounds very tasty, will have to give it a try. I am looking for a crock pot pork roast recipe. Any you would recommend? I have a tip for bean cooking. If you prefer to use dry beans instead of canned, but don't want to plan ahead to soak, do what I do. I pre-soak a huge batch of beans, drain them and then freeze them in recipe-size amounts. I try to make sure the container the beans are in is a shape that will fit in the crock-pot. That way, I can pop the frozen bean cube out of the freezer container and put it right in the crock-pot and continue with the recipe. This has saved me a lot of time without the "front-end" time commitment of cooking the beans. My friends mom makes this but she uses black olives instead of mushrooms... It's so good! BTW thanks for doing this, I have made JM Ribs and Baked Potatoes thus far and looking forward to making more of your recipes! I am a vegan and was wondering how you think this soup would turn out if I ommited the chicken and added tofu or maybe more beans? Looks like another winner Stephanie. Thanks for posting a recipe with dried beans...I've always wanted to try them since they are so much cheaper. I think my family would love this soup. If you leave the tomato ingredients out until the last hour of cooking, your beans will soften up much quicker. You could cook on low for 6-8 hours, then add the tomatoes and cook for another hour, and everything would be done. The acid in the tomatoes inhibits the beans from getting soft. If you substitute one can of refried beans and no mushrooms, you have my version of chicken tortilla soup. Very Yummy! I love your site! I just got my first slow cooker, and I'm in love. I noticed that you said that you put in the chick raw and frozen - in general, is that an okay thing to do with chicken? Same with pork and beef? Sure you don't want to do another 365 days?? Hi Dory, it's okay to use frozen meat, and in many cases it's actually preferable because it takes longer to cook, and those who are out of the house for long periods need the food to cook a long time. Here's what Crock-Pot has to say. Just read today that PACE isn't considered GF by the Campbell's Company any more. Neither is Prego Sauce. They've changed their ways...sad for those of us who depend on them for occ. GF foods. I tried a very similar recipe today, I never have the right stuff on hand, and YUMMY! I used kidney beans, canned corn and no mushrooms.... but we LOVED it, a big hit with the whole family! This was A-MAAA-ZING! Used three whole frozen chicken breasts, one can of black beans and one can of garbanzo beans. I took the chicken breasts out to shred before I served the soup and they were so tender they were falling apart. Can't wait to share this recipe over the winter. Such a hearty and easy soup! I soaked my beans 14-15 hours but they still took FOREVER to cook. Cooked in a big CrockPot on low for 5 hours and on high for 3, and they were soft but I would have liked them a little bit softer! Also I shredded the chicken after the 5 hours on low. Thanks for a yummy one! this is tomorrow nights dinner for sure! it sounds fabulous! Any thoughts on this being a freezer friendly?? Maybe leaving the sour cream out until ready to serve it. I have also found my crockpot useful for preparing frozen meals, we do a meal swap with my moms group. yeah. I think for best results I'd leave out the sour cream before serving. I've frozen sour cream before in containers (buy one get one free kind of thing) and I've frozen soup with cream and such, but the general wisdom says not to. ugh. I'm sorry, anon. I've heard from readers that some water is too hard for black beans. Have you ever been able to soften them? Are other beans okay? here's an article that might be helpful: beans won't soften troubleshooting. Ok, that explains it, our water is very hard. They finally were okay by the time we ate at 6 pm - Next time, I'll use a can or boil the beans first! The soup was yummy although my salsa made it too spicy for my kiddos. Hubby LOVED it! Glad I have the knowledge about the hard water and beans. LOVE your blog! I am addicted,,,,,,,,,,,,,,, Sorry I found it at the end of the year! This is on my menu for the upcoming week although it may get leftover turkey instead of chicken depending on how much we eat of Thursday and Friday. I'm sad I didn't like this more!!! This recipe is a WINNER!!! My 2 year old pilfered off most of my bowl and he had already eaten dinner! Thank you for this one -- I can't wait to make it again. I made this last night and it was great after I added in some hot sauce and extra cumin at the end. I also used leftover shredded turkey that I added after cooking the soup all day and running the immersian blender through the beans. I think next time I will add additional salsa and seasonings at the beginning. My whole family raved and I will be making this again!! My husband isn't a soup fan, so since he's away :P, we're having this for dinner! I'm sure it will be fabulous! Thanks, Stephanie, for rising to this challenge. I've enjoyed your blog! This was sooooo good! My kids ate 3 bowls each (and one informed me before we ate that she did not really like black bean soup!) It took about 5 1/2 hours on low with canned beans. I stirred in some sour cream and shredded cheese. Everyone else just used cheese! I was so excited when they kept coming back for more! Thanks Stephanie! Oh, and we made the chocolate fondue for dessert - excellent! We loved this! I blended it a lot because my kids are convinced they hate mushrooms and beans, but they both ate two bowls with tortilla chips and cheese. Two different people mentioned having hard beans after putting their beans on low and then high. You've got to do the opposite. If you or someone else can be there to turn it down, it's ideal to keep it on high long enough to boil (1.5-2 hours at least?) and then turn it down to low for as long as you want. I also don't think there'd be a problem cooking black beans on high for the whole time. I can't speak to the hard water problem, but my old roommate used to cover dry beans with a bunch of water and cook 'em all day without even a pre-soak, and there was no problem- I'm guessing she just used high. The other VERY important things is that you cannot add salt to a recipe with dry beans until they are soft. The salt can keep them from absorbing enough water and they will stay hard. The reason I like to soak over night and drain and rinse is because beans release gas into the soaking water and you can get rid of some of it into the sink instead of your stomach. Then the bean liquor you're left with after you cook has less gas and more deliciousness. Last thing- I DEFINITELY always rinse canned beans for the same reason, you'll notice how bubbly they get when you rinse of all that gunk! I made this earlier this week and it was delicious. Definitely a keeper recipe for my family. I did soak my beans overnight, then cooked for 8 hours on low (first and last hour on hight). The beans still had a tiny bit of crunch to them. Next time I'll make sure to cook the soup a little longer. I made this last night just to have something completely different from our big Thanksgiving feast, and it was a huge hit! Instead of chicken I put in some leftover turkey. Also, I don't mind a little chopping, so I skipped the jar of salsa and added 1 chopped onion, 2 cloves garlic (minced), 1/2 small can of diced green chilies, and 1 can petite diced tomatoes with their liquid. Basically, salsa. :-) A squeeze of lime was a great finishing touch along with sour cream, cheese, and cilantro. Very good and economical too! My kids cleaned their bowls and asked for seconds. I tried this tonight with a few modifications. Didn't have enough chicken stock so I used a can of beef broth as well. Only had 1 can of black beans. I also used about 3/4 bag of frozen mirepoix and some frozen "fresh" salsa I bought on manager special. Increased the cumin, decreased the sour cream and added 1 T of chili powder. I used the frozen chicken, frozen mirepoix, and frozen salsa. On high, it only took about 5 hours! My kids gobbled it up!! I made this after Thanksgiving for my boyfriend and family...they loved it. How easy can it get? I made this yesterday, omitting the chicken and using vegetable broth. I think I must have hard water, because it took almost 10 hours on high, even though I soaked the beans. (My crock-pot is turbo charged or something and usually cooks things in half the time recipes call for.) It made the apartment smell great, and it tasted fabulous. This recipe is a keeper. I made this yesterday. It made the house smell so good and we all loved the way it tasted. I will absolutely be making it again. This is one of my new favorites. It was soooo good. I did not put in mushroooms, but had celery, carrots, red/yellow peppers, onions so put them all in. I also blended it some with my hand held to make it more soupy. Great! This is in the crock pot as we speak... it is smelling delicious.. I love the "southwest" style of it. Thanks for sharing this.. I am going to containerize it and put it in the fridge for some "points friendly" lunches for work! I used canned corn - no frozen on hand and I needed to use up some of the canned goods I have... hopefully it wont throw it off too much.. This soup in AWESOME!!! My family loved it. Thanks. This was very very good. I added a little hotsauce and lime juice, which goes very well with black beans. Yummy. Oh I forgot, since I have 2 very little children - I used the canned beans. Discovered your blog a few weeks ago, but just came upon this one to try the other day. It was AWESOME! My husband and I had 3 bowls each(!) and pretty much cleaned it out of the pot between the 2 of us. I feel like kinda of a pig for doing that but it was SO good. Especially with the lime, cilantro, cheese, sour cream, and avocado additions. I will definitely make this again sometime. And how freeing was it to use frozen chicken without having to thaw? That might have been my favorite part of all. We even crumbled up some tortilla chips and threw them on top for fun! Can't wait to try some more yummy crockpot recipes! We love this soup! It is so very yummy. It is right now in my crockpot for the third time. Oh my, is this good! Thanks for such an easy, tasty recipe. I cooked the soaked beans (in the broth) for several hours on high before adding the rest of the ingredients. I added garlic, about half a chopped onion, carrots and a chopped bell pepper. Next time I might double the recipe and freeze the leftovers for "instant" dinners. I stumbled upon your blog through another site and I am sure glad I did. I did this recipe last night and it was FABULOUS. Thank you. I look forward to trying more(actually the dijon chicken is in the pot now). And I have already shared your blog link with all my friends who were looking for more options for dinner. Thank you again and good luck with the recipe book! We tried this today and it was absolutely scrummy. My 18 month old thought so too! This is seriously the best soup I have ever had. To the point where I think someone who hates beans salsa and sour cream would STILL love it! SO SO good! I made it to the T a few months back. We have recently gone veg, so I made it today with about 1/3 cup TVP & veggie broth (obviously omitting the chicken) and it was just as good. I've made something similar to this for years and love it. I don't use the broth so it's more of a main dish than a soup. I use 2 cans black beans, 2 cans corn or 1 16oz pkg frozen corn, 16oz salsa, and usually 4 chicken breasts. I am making this right now and it smells awesome. It has been cooking about 5 hours. I just tested a bean and it was pretty tender already, and it has been cooking on low. I have not added the salsa yet. I had heard that tomato products and vinegar (acids) keep beans from softening. So I will add the salsa maybe an hour or two before serving. I have tried quite a few things from your site and all have been yummy so far! (Chicken Mole, Makhani Chicken, Brown Sugar Chicken, Morrocan Lentil Soup, Pulled Pork, are the ones I can think of off the top of my head.) What a great resource! Thanks! Just back to report on my success, since I commented earlier when it was still cooking. It came out really well. It worked just great to add the salsa a couple of hours before serving. It cooked on low for about 9 hours I think. Beans were nice and tender. I did pre-soak overnight. I don't have an immersion blender, so used the traditional. Nice and hearty, which is how I like soup. I used plain yogurt instead of sour cream. Also, I used the lime juice as a couple of comments mentioned. I think it really made a difference! (You may want to consider adding it to your ingredient list! :) Yummy- thanks again! I made this yesterday, it was wonderful! Just curious if I could make this using black eyed peas instead of black beans? I've been looking forward to making this for days, and just realised the package in the cupboard I thought was black beans was in fact black eyed peas. Anyone know if that would be all right? the soup would certainly cook the exact same way. Black Eyed Peas taste a bit "earthier" than black beans, but will perform the same way. Your soup will be a different color, and I would definitely blend a bit at the end to improve consistency, since the peas are a bit heartier. ½ jar of black bean and corn salsa – I guess whatever salsa flavor you like…. I threw evrything in at 9:30 last night, on low, and took it off at 7 am this morning. I was skeptical about the frozen chicken not cooking and tasting weird, but let me tell you…fantastic…I think pre-cooked grilled chicken mite be good as well. Tried this about 3 weeks ago and have now made it 3 times. OMG IS IT GOOD!! I started making double batches because we can't get enough! Serve it with shredded cheddar and crushed tortilla chips on top. THANK YOU! I'm full to bursting with this soup right now. SO GOOD. I used canned beans and fresh chicken, and it turned out just divine. Also, I bought an immersable blender about maybe two weeks ago and it is awesome. Thanks for posting about it so many times! I LOVE your site! But because I haven't followed daily (I really should! ), I just found this recipe. Anyway, this is a great soup, and I added Mirepoix to it (the pre-chopped celery, carrots, and onions) becuase I had some in my fridge that needed to be used. It was great! My family loves this! We normally serve with crunched corn chips, shredded cheddar, and sour cream dabbed on top. My youngest prefers to eat this as a "salsa" with the chips, but the rest of us love it just the way it is! Plus, it freezes really well, so it's easy to get 2 meals out of a 5 minute prep! Does it get any easier? I know I'm a late commenter, but just wanted to say that I tossed this in the crockpot before church this morning (using pre-thawed chicken and canned beans) and we came home this afternoon to the glorious aroma of lunch waiting for us. My husband and I both loved it and will definitely be making it again. I loved this. LOVED IT. My boyfriend and I like spicy, so I added some chopped onion, some jalapenos and some hot sauce. I was REALLY looking forward to leftovers for lunch today, but the meeting I was at had lunch brought in. I have NEVER been disappointed in a free lunch, but I just really wanted to come home and eat this soup! Thanks for sharing this recipe! I used one can of black beans, drained. Put them at the bottom of the crock pot, put in 2 frozen chicken breasts, a cup of frozen corn, some diced up peppers. I only used 2 cans of chicken broth (so 284 ml a can) and half the salsa, no cumin, and at the end I used helluva good dip instead of plain sour cream. Garnished with cheese & baked corn chips :) My family really liked it - there was a lot of chicken so it was a thick stew. Great way to get them to eat beans!! I've been enjoying reading your blog - I just got my own slow cooker. So far I've made ribs, roast beef, and a few chicken dishes. I love cooking these dishes for my family even though I myself am a vegetarian!! :) Thanks for the great stew/soup recipe. I made this last week and now I'm trying to justify making it again today. It was that good. I used canned beans and canned corn since that's what was in the pantry and it came out great. Yum! Thanks! Rediculously LOVE this receipe. I often dont think to throw it in the crockpot so I have adapted it for the stove. I used pre-cooked and deboned chicken throw everything in heat for a while, blend a little and WAHLAH excellent soup! Thank you so much for the recipe, I LOVE IT! I made this yesterday and it was great! I loved that I didn't have to pre-cook or chop anything. I soaked the beans overnight and then put everything in the crockpot in the morning before work. I served it over cooked rice and my 18 month old gobbled it up. I used mild salsa, but next time, I think I'll try medium. I'll also add cilantro and lime at the end. Thanks for a fabulous recipe, with so many options! I'm making this soup for the 4th time, and I just can't say enough about how good it is! I've never been crazy about how chicken comes out in the crockpot, but everything else about this soup sounded so good, I just HAD to try it. I'm so glad I did! I wouldn't change a thing about it, and the avacado on top, is like icing on the cake. Yum. Thanks so much for sharing this yummy goodness! Fabulous recipe. Super simple. We added some carrots and would like more cumin, so added that to the leftovers. A tip for making soft beans (tho I used canned for this recipe, as that was what was in the pantry) - put some seaweed or Kombu into the beans with the water as you are softening them. It really helps (and also somehow takes away some of the gaseousness). It works great for pinto beans as well. Just discovered this website a few days ago and was amazed at all of the creative uses for a crock pot. This soup was my first adventure...and it turned out AMAZING! I used dry beans, soaked for about 8 hours and even though we have hard water at our house, they softened right up in the crock pot! I threw everything in at around 2am, and it was ready for a cold-weather weekend lunch. We sprinkled shredded cheese and crumpled tortilla chips on each bowlful. I will DEFINITELY be making this again. Thanks! I added three whole cloves of garlic and used boneless chicken thighs which stay really moist. This is even better than the taco soup recipe. I'm making this right now! I'm so excited! It reminds me of my mom's chicken tortilla soup but tastier for my kiddo. Thanks so much! Yes, it makes about 6 1-cup servings. I make this at least once a month, and have turned a colleague and my mother onto it as well. I absolutely LOVED this soup, and conveniently made it right before Snow-mageddon hit! So I had plenty of it to get me through being stuck at home. It was perfect and tasted GREAT! My roommate also enjoyed it and ate it with some chips with dinner one night. Will totally be making this again! I'm so glad to read this- I tried to make a black bean soup with dried beans once and it turned out terrible- the beans never softened and we went out to Filibertos! 9 hrs on high, I will try again! 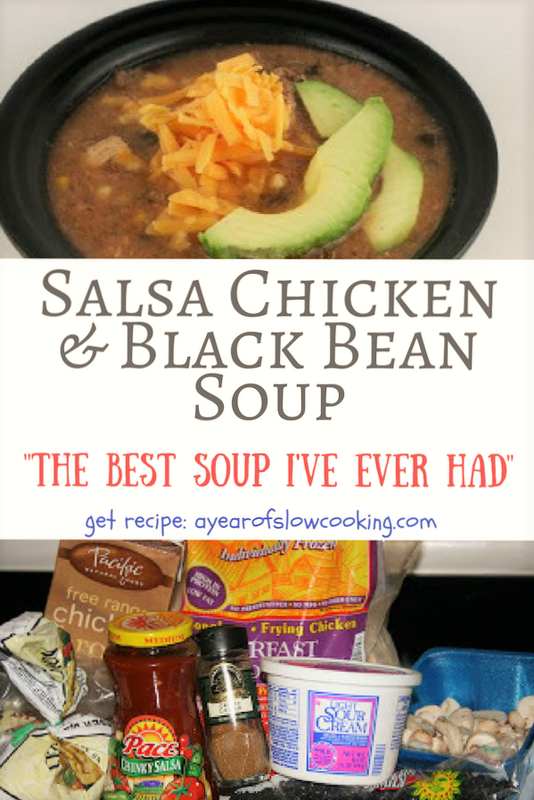 I made a cross between this and the Salsa Chicken - I started out making that one, but realized my ingredients weren't close to filling the cooker, so I added about 4 cups of chicken broth. It came out as a pretty thick soup, and it was yummy! I used Tomatillo-Habanero salsa from Rosa Mexicano, so it was spicy, so I didn't add any other spices. I chopped up a red pepper, which went well, and didn't include any mushrooms. So easy, and very tasty! Yum! I didn't have salsa like I thought so I substituted a can of rotel tomatoes with peppers and a little garlic and it was great! I served it over rice to make it easier for my 2 and 4 year olds to eat and the 2 year old ate two bowls! :) They both liked it and Mommy enjoyed it too! It was nice and warm and perfect after a long day of swimming! Thanks!! thank you for this! i love black beans and am always looking for new ways to use the dry ones because they are so cheap and tastey and healthy! i didn't have Salsa, but had ro-tel, so i used a can of ro-tel plus some grated onion, a couple of cloves of garlic, and about 1/2 tsp of salt to make the ro-tel more like salsa. i think i followed everything else the same....except canned corn instead of frozen, and i left out the mushrooms because i hate them! turned out very tasty..and great to come home to after a long day! with beans soaked overnight, mine was perfect at 6 hrs. OH. MY. GOD. get your crockpot out NOW and make this for tomorrow. Just as the hubs was saying "I'm not thrilled with this crockpot kick you're on", this got a huge thumbs up. He was lucky, b/c I was about to throw the crockpot at him. I'd strongly recommend the Trader Joe's red salsa, it's right on the border of mild with a tinge of spice. Tomorrow I'm using up the chicken part of the soup to make tacos. This is really, really yummy! I went vegetarian and left the chicken out. To make up for the volume I added carrot and celery finely chopped. I used a medium chipotle salsa, too. It added a great hint of smokiness to the flavor!! I thickened it at the end with instant potato flakes and then served it with cornbread. This will definitely be made again! Maybe next time I'll make WITH the chicken. Keep up the awesome recipes!! This soup has been an absolute favorite in our family since you posted it. We have made it over and over again. Well, tonight we were CRAVING this soup, but obviously didn't have time to put it in the crockpot. I threw everything into a pot on the stove (using canned black beans this time) and it was done in 20 minutes and just as awesome as before!! Oh, I should mention....I used some shredded up rotisserie chicken from Sam's instead of the raw chicken that I would normally put in the crockpot. Seriously...SO good!! I commented yesterday under your Hawaiian Ribs recipe. I said I was going to make the apricot chicken, but didn't have all the ingredients. Then I saw this recipe and I had everything for it. It was so good! I had leftover basmati rice from the night before, and I scooped that in a ice cream scoop and set it on the soup. Yum! Thank you again for all your wonderful recipes. Those two recipes are going on my blog as favorites. I found this recipe about 3 weeks ago and have made it twice already!! It is great and the family loves it. No idea how it reheats, it has all been eaten both times I've made it! I made this for a very skeptical hubby and one equally skeptical son last night and they had to admit that it was very good! Yea!! (I had one son on my side from the beginning.) Thanks for the great recipe!! Making this tonight with not-totally-thawed boneless chicken, 1 can of black beans and 1 can of chili beans, a can of "fiesta" corn, plus whatever else I have hanging around. Excited! Not that you need another voice to say so but O! M! G!! this is good and easy :) I made it with frozen boneless chicken breasts but think next time I'll go w boneless thighs because they crock-pot up so much better. Thank you for this, another of your recipes makes it into our household rotation! omg, this was DELICIOUS! definitely a keeper! i left out the corn and added some bell peppers. hubby didnt even mind the mushrooms! next time im going to omit the chicken and add another can of beans and a can of diced tomatoes to make a vegetarian soup. i am going to use the leftovers to make layered enchiladas later this week.....yum! I see this recipe was posted over two years ago, but I gave it a whirl for the first time yesterday and absolutely LOVED it. I made just a few changes to suit my own personal tastes, and I can't get enough of it. I made this 2 weeks ago, but I found it WAY too salty. It was like a salt lick. It also wasn't a soup - I think my beans soaked up all of the liquid so that it was more chicken and black bean dip than soup. I'm trying it again with low sodium salsa and increasing the liquid with water to 6 cups. Tonight I needed something I could just pop on the stove to simmer for an hour so I could finish working. I threw this into my largest cooking pot and it's upstairs simmering now. Smells wonderful! Since I'm not slow-cooking it, I think I'll let it go for about an hour on the stove-top. I didn't have any mushrooms, so I added a chopped carrot. We like spicy, so I also added some pureed chipotle pepper- we'll see how it comes out. Going to try plain greek yougurt instead of sour cream too.....I'm thinking YUM!!! Thank you so much for this- it's one of my favourites because it's QUICK, EASY and dee-LISH! I used a similar recipe that called for a can of baked beans and it was really good also. I'm wondering if this might be because you're using regular broth? The low sodium broth makes a huge difference. I would double check your ingredients for hidden sodium. And if your beans are soaking up the liquid they might not have been fully pre-soaked. Just a thought. I make this soup ALL THE TIME and have found it's a great "garbage" soup - throw in anything from the fridge that you need to get rid of (leftover veggies, soggy celery, even potatoes and noodles). You'd never know there's anything different!! Ion.Ash, You can skip the blending part. That's really to thicken it up a bit--- the flavor will be there without the blendification. Thank you so much for getting back to me so quick. I really appreciate it! Btw enjoyed reading this blog and can't wait to try a few more of your recipes! Yum can't wait to try it when its done! I tried this recipe today and it tastes fabulous. It was so easy to make, it's hard to believe it tastes so good! I will say 8 hours on low was too long for my frozen chicken breast tenderloins. The chicken was overcooked and bland. I'd cook the chick no more than 6 hours next time. And even with that the soup tasted fabulous! I removed most of the chicken and used some leftover cooked ground turkey - from tacos a couple nights ago. It was really nice with the ground turkey and I'd do that again if I had leftover from tacos. Thanks for this recipe, I'll definitely be making this again. That was super yummy. I cant wait to make it for a baby shower im hosting soon with a mexican theme for food. I've been searching for the perfect black bean soup (and one that the husband will eat too) and it seems that my search is over! So easy, love that I can put the chicken in RAW and FROZEN! I added diced carrots, omitted mushrooms, and used Tastefully Simple's Simply Southwest seasoning (2 tsp.) instead of the cumin. I'm also going to add some cilantro and lime juice right before we dish up. Hi Stephanie...I'm new to slow cooking as I got my first ever crock pot just over a week ago. I must say that I love your blog and your sense of humour. So far, I have made the Philadelphia cheese steaks (I think I cooked it for too long), French Onion soup yesterday which was lovely and then last night I spotted your chocolate fudge pudding recipe and decided to attempt that. In the end, I decided that my crock pot was too big for that recipe (6.5L) so I ended up bunging it into the oven instead. It was gorgeous!! Today, I did the Salsa Chicken and Black Bean Soup. I followed your recipe pretty much exactly except that I used cooked chicken so I just threw that in for the last hour. It was delicious. I served it over rice as I have three men in the house over six foot tall and they need a lot of filling up. I just had it as the soup. In fact, I could drink the liquid part only it was so good. Not one complaint amd a lot of praise from the family, and hubby has already claimed rights to the leftovers. I'm trying this out tomorrow night! I don't have enough salsa so I'm going to use a can of Rotel, the bit of salsa I do have, some "Creole mix" (chopped onions, garlic, parsley and celery), and more garlic (I like garlic). I'm also leaving out the corn and mushrooms as I don't like either of those things. That's more cholesterol than I would like (I'm not sure why it's so high?) but the low-fat, high fiber aspect of it is nice! I can't wait to try it! I'm cooking this for dinner tomorrow. Looking forward to it! This looks so awesome... I'm buying all the needed ingredients to make this tomorrow! If you cook beans until soft beans before adding tomato products, they cook a lot faster. I have been making this recipe once a month if not MORE since I found it. I am sure I will be making it for years to come! Made this last night and the whole family loved it! My favorite part was how fast it was. Perfect for a busy school night. Thanks SO much! I LOVE this recipe. It's so easy, and my family loves it! If we have a little leftover and it's gotten kind of thick from sitting in the crockpot, it makes FABULOUS chicken black bean burritos. I just put a spoonful on a tortilla with some cheese, roll it up and take it in my lunch the next day. I've even frozen the burritos. Just reheat in the microwave. Delicious! I made this for dinner tonight- I added green peppers and onions and garlic. It was so good and very very easy- I made it on the stove instead of the crockpot and it took less than an hour. Oops just made this using an entire pound of black beans that I had soaked overnight (and didn't double the rest of the ingredients) so hopefully it will still turn out well...might have to add some extra water or stock, we will see. Best Soup i have ever had my family loved it sooo good! will add this to my monthly meals thanks so much for the wonderful recipe God Bless! Hi anon, yes!! That sounds good to me! Enjoy!